The historic town of Whitehaven is situated on the northwest coast of England in the county of Cumbria and nestles between the Irish Sea and the beautiful Lake District. Not only is the town itself steeped in history, but the Male Voice movement can also be traced back to the 1800’s and can boast that in the early 1900’s a local Miners’ Male Voice Choir was formed, to raise funds during the Miners’ lock-out. 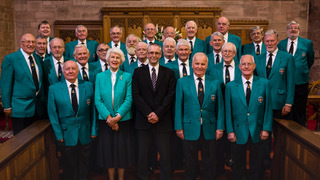 Founded in 1977, the present Whitehaven Male Voice Choir has established an enviable reputation among the musical world of male voices in Britain, along with appearances on local radio and television. During the Choir’s existence, it has taken part in many musical festivals and proven its quality by winning many first prizes, has been joined in concert by world renowned soloists and choirs from Britain and America; and is proud to have helped raise hundreds of thousands of pounds for charity. The Choir’s greatest delight is to let their enthusiasm and love of singing well-over for the enjoyment of others.